The sheer face of Neist Point on the Isle of Skye. Wellingtons and raincoats at the ready for a chance to disembark The Princess and get ashore. 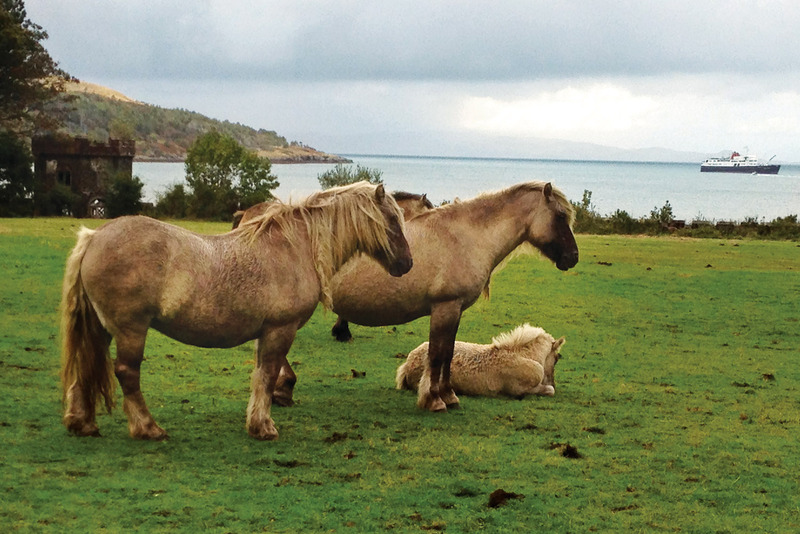 Ponies on the Isle of Rum. The quaint village of Plockton, on the shores of Loch Carron. 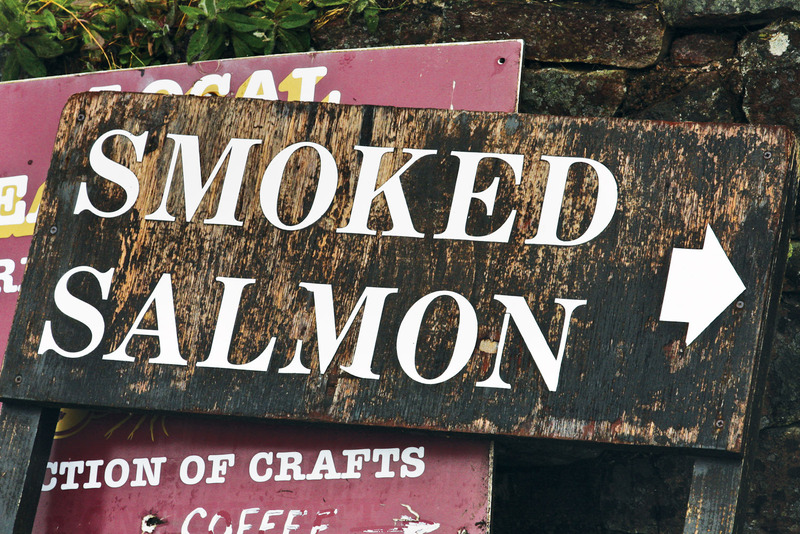 Smoked salmon, a speciality up in the Scottish Hebrides. 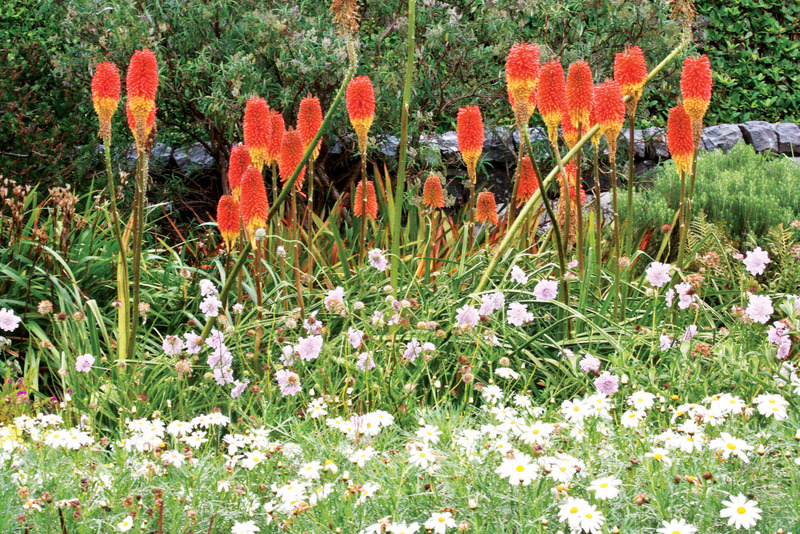 A colourful corner of Inverewe Gardens. 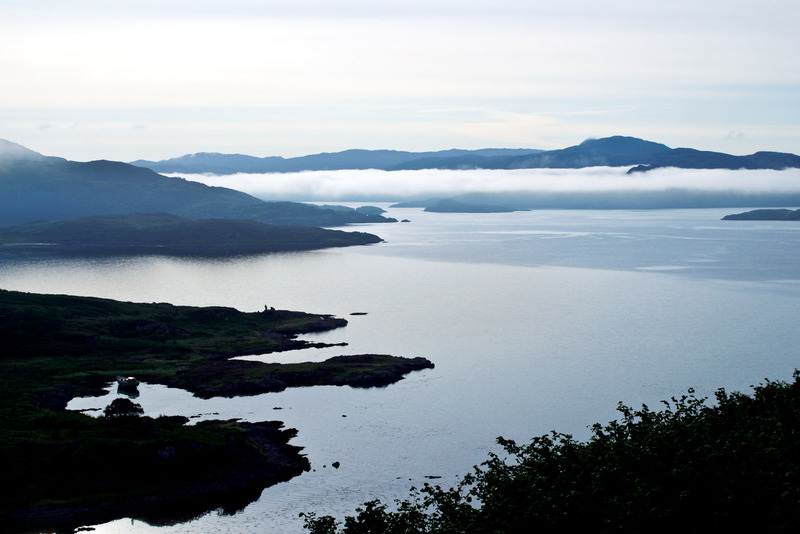 Clouds form over the Inner Hebrides. 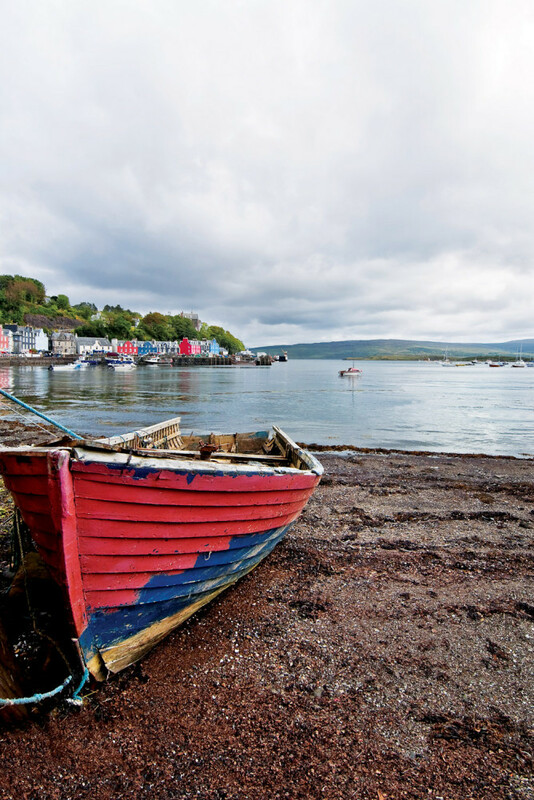 Pretty Tobermory on the Isle of Mull. A fishing boat waits at Ardvasar, Isle of Skye. Picturesque Portree port, Isle of Skye. The Scottish Hebrides are a stunning melange of dramatic coastline, wide uninterrupted expanses of green and pastel-hued towns. And the best way to see them? Watching it all go by from a regal distance. By Tricia Welsh. Copies of Country Life grace coffee tables and guests in pearls and cashmere sip pre-lunch Pimms as a warming gas-fire glows in the inglenook fireplace. We could be staying in a lovely English manor house or a luxury country hotel, but we are in fact on board the MV Hebridean Princess on a seven-night Hebridean Autumn cruise around the Scottish Hebrides. Having been piped on in true Scottish style in the pretty port of Oban, we check into our Isle of Iona cabin (all 30 cabins are named after islands, castles and lochs in the region) on the Promenade Deck, the second from the top of five. This most comfortable cruise ship can accommodate up to 50 guests – we are just 40, with a crew of 38, giving it one of the highest ratios of staff to crew anywhere. Our itinerary takes us north from Oban to the picturesque village of Plockton, through the Small Isles, on to Ullapool and down again via Portree on the Isle of Skye, calling in to the Isle of Rum, then to postcard-pretty Tobermory on the Isle of Mull before disembarking a week later in Oban. Daily excursions take in castles, remote island communities, the odd whisky distillery, and gardens such as Inverewe Gardens with exotic plants and winding paths through woodlands. 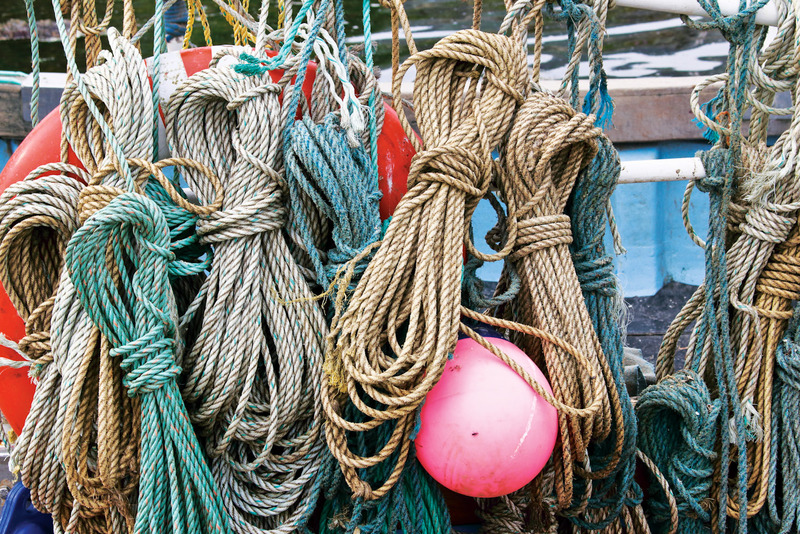 It’s a remote, rural existence on the islands and throughout the Highlands with isolated communities, simple farmlets and characterful fishing villages with small, almost cottage industries such as salmon smoking. In Shieldaig, we meet Mandy Aves who has been smoking Wester Ross salmon for a number of years, dry smoking the local delicacy over oak chips. At Christmas time, she tells us, she posts more than 400 sides to her loyal clientele around the UK. 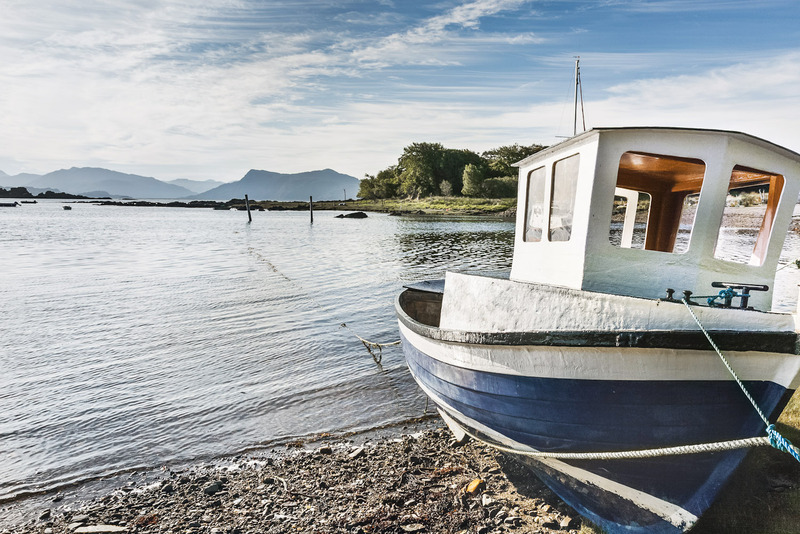 We recognise the tranquil little harbour of Plockton – beautiful even at low tide – and the quaint village of the same name, population 378, as the idyllic location for the quirky television series, Hamish Macbeth. 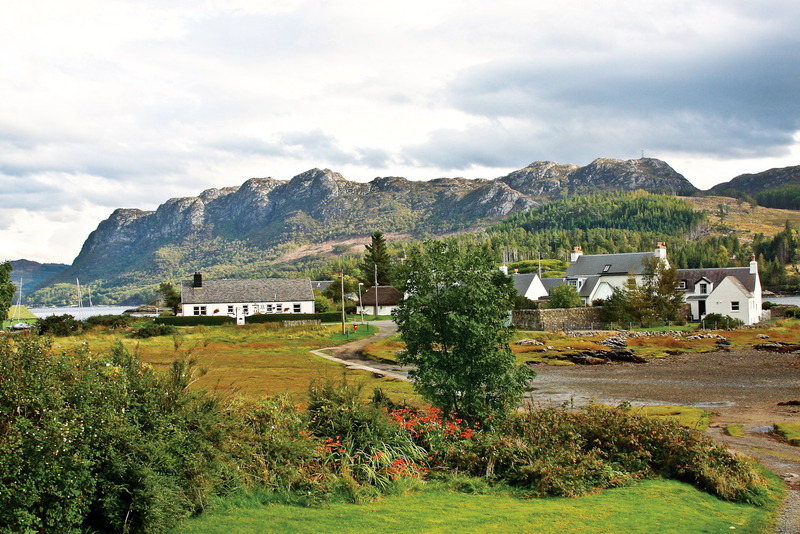 Overlooking the harbour, stone and white-painted row houses line one side of virtually the only street in town, hydrangeas bloom behind low stone walls and Plockton Shores’ licensed grocer does a lively trade from the ship’s passengers looking for souvenirs and postcards. We stop to chat to an apiarist who gives us a taste of his wild heather honeycomb. In Portree, on the lyrical Isle of Skye, we browse shops for Harris Tweed jackets and caps, admire local pottery and buy an I love Skye coffee cup for our granddaughter who shares the same name. The stately 13th-century Duart Castle, ancestral home of the McLean clan, where the 28th chieftain and his family still live, enjoys an imposing position by the water’s edge on the island of Mull. Queen Victoria was an early visitor here, as was composer Felix Mendelssohn whose life-changing journey through Scotland inspired him to write one of his most famous works: The Hebrides Overture (Fingal’s Cave). 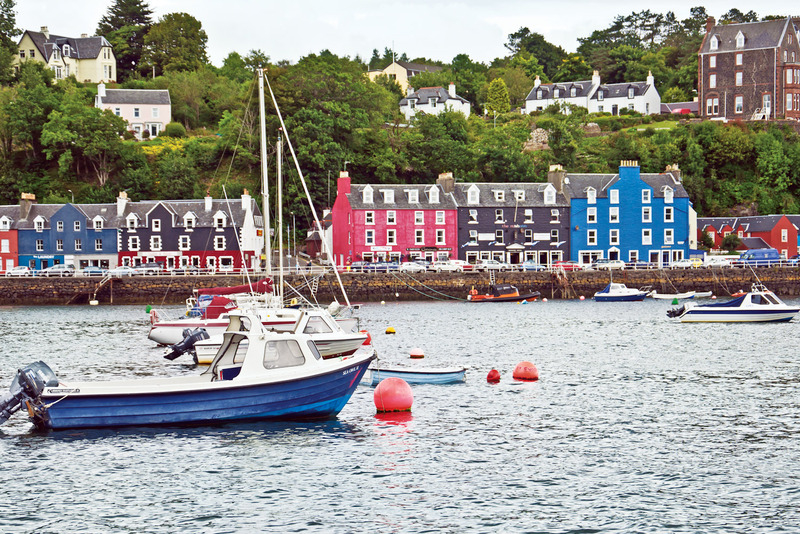 We can’t quite believe our eyes as the township of Tobermory eventually comes into view. It must be everyone’s idea of a fairytale village with its string of rainbow-coloured houses along the foreshore and backdrop of castle-like hotels. There are signs such as ‘Care – Otter on road’ and ‘Five porpoise seen off Tobermory Lighthouse’, with yet more sightings of minke whales nearby. As the setting for the popular UK children’s program Balamory that concluded in 2005, beleaguered parents still beat a constant path to the door of the large pink harbourside building where the shop owners are happy to sell all sorts of related toys and books. The township also boasts the 1798-established Tobermory single malt whisky distillery where we take a tour with tastings. And although the weather is soggy, a real highlight is a private visit to Kinloch Castle on the Isle of Rum, where eccentric former owner George Bullough once kept hummingbirds in a greenhouse and alligators in the garden. Although no longer inhabited, it remains a charming reminder of the whimsical decadence of the aristocracy of a bygone era. A string of hardy Rum ponies, peculiar to the islands and the Highlands, graze in the grounds oblivious to our presence. It’s towards the end of the cruising season, which starts in March and continues through to mid-November, and the weather, although unpredictable, remains surprisingly mild and well behaved. Sou’westers, waterproof pants and Wellingtons are available for guests’ use, but most come well prepared, and are pleasantly surprised when it’s not so dreich. We hear this Scottish term several times and have it explained to us by onboard guide extraordinaire, Sue Gruellich. “It simply means ‘grim’,” she says. According to the dictionary, at least four of the following adjectives must apply before the weather is truly dreich: ‘A combination of dull, overcast, drizzly, cold, misty and miserable weather’. Many jokes are made about Scottish weather, but we fondly recall this one: It only rained twice last week: the first time for three days, the second for four. 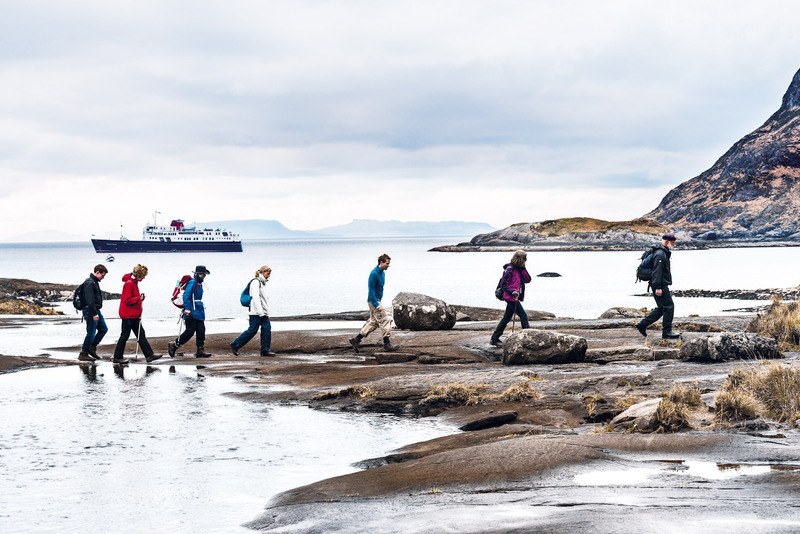 Given that the weather in this part of the world can be unreliable, a cruise on the Hebridean Princess is as much about life on board as the ports of call. Cabins must be among the most elegant afloat. More like plush hotel rooms, they are furnished with luxuriant fabrics, comfortable lounge chairs, mostly king beds – some with half-testers – and spacious bathrooms, many with full-size bathtubs. It’s jackets and ties each evening as guests meet and mingle in the Tiree Lounge and sink into comfy chairs to indulge in the good old-fashioned art of conversation. Stewards shake cocktails, pour local whiskies and offer pre-dinner canapés as chief purser David Indge tells shaggy-dog stories or perhaps a local harpist entertains with a repertoire of popular Scottish tunes. MacBrayne inter-island car ferry and Royal Mail ship. White-gloved waiters quickly commit guests’ names to memory and, with surprising speed, know each guest’s favourite tipple. Couples can choose to dine romantically à deux, or accept a senior officer’s invitation to join them and other guests at a larger table. Meals are exceptional with hearty cooked breakfasts and four courses for lunch and dinner. Lunch might be poached asparagus with hollandaise sauce followed by a seafood buffet of whole West Coast salmon. Dinner choices include roast rack of Ayrshire lamb or saddle of Highland venison, perhaps grilled fillet of turbot, monkfish tail wrapped in streaky bacon or pan-seared fillet of sea bass on creamy crab and herb tagliatelle. There is always a good selection of British and imported cheese such as Orkney cheddar, Highlands’ Blue Murder from the Isle of Mull and Gruth Dhu, a Highland double cream covered in oats and peppercorns. On the farewell night, local Scottish heritage is celebrated with a traditional ‘Address to the Haggis’ in true Robbie Burns style with the haggis being piped in, and the captain cutting it open with a ceremonial dagger. Life on board could be likened to a house party in a luxurious country house – only floating around some of the most picturesque, rugged and remote parts of Scotland accessible, in some cases, only by sea. 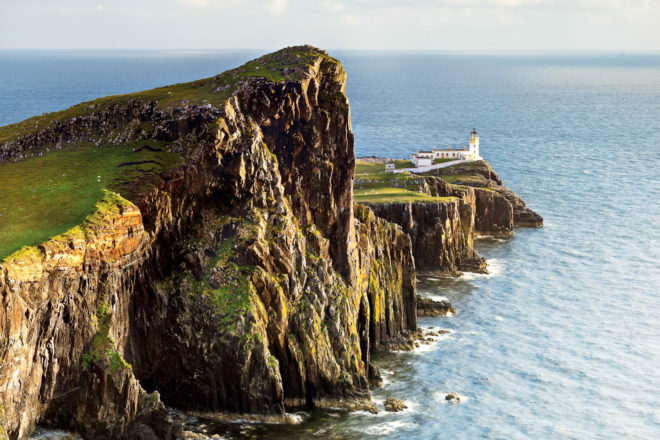 Many of the Inner and Outer Hebrides – rugged island and countless islands that stretch down the west coast of Scotland – are otherwise inaccessible, hence a cruise is the ideal way to experience their remoteness and charm. Qatar Airways flies daily from Melbourne and Perth to Edinburgh via Doha daily, with fares from $1650. Etihad Airways flies daily from Sydney to Edinburgh via Abu Dhabi with fares starting from $1648. The Hebridean Princess offers four- to nine-night cruises around the Highlands and islands of Scotland from March to November. The all-inclusive tariff (including all beverages and gratuities) per person, twin share ranges from $2570 for a four-night cruise to $29,399 for a nine-night cruise in a balcony suite.